MPN: 0M618F 0M619F 0D233N D235PD-00. Model: Optiplex 360,380. Dell Optilpex 380. Dell Optilpex 360. Form_Factor: Desktop. Most printers go to the refurbishing process after the order is made. Also you will find all the parts that you may need for your computer, laptop from motherboards to power supplies. Dell P/N: T128K. PowerEdge T310 (tower). This is a genuine Dell product pulled from used systems and item has been fully tested for minimum 2 hours with actual Dell system. Max Output Power. No product liability is included under any circumstances. Total Power: 650W. - Efficiency: 80% min on 230AC/50Hz & 78% min on 115VAC/60Hz at full load. - Input Range: 90~264VAC, Full Range Input. - MTBF: 100,000 hours on maximum load at 25°C. It's fun and easy and everyone wins. Part numbers are K345R K346R K340R 9RD1W and similar. P1 - 24-Pin Mini ATX Power Connector. P7 - 4-Pin Floppy Drive Power Connector. P2 - 4-Pin ATX Power Connector. P3 - SATA Power. P5 - SATA Power. Dell P/N MH300. The Door is always open. Model# 2TXYM /RV1C4 /3WN11. The model may vary. (RV14C, 3WN11 and etc. ). Item is used and works perfectly. We will respond promptly to your inquiry. This is for a SFF Dell computer. not a larger Desktop or Mini Tower. No International, including Canada. No P.O. Box, Alaska, Hawaii, Guam, Puerto Rico, AFO, APO. Used Tested/Working. G24H2, FN1VT. Max Output Power. It's made to last and it's truly the largest difference between the stuff you "can get" and the stuff you must have to change the way you compute. We'll be happy to assist! N884K Poweredge T310 400W Redundant Power Supply. OUTPUT POWER 525W. If you prefer you may also feel free to recycle such materials to any local R2 or e-Stewards certified recycler. Dell Optiplex 380, 580, 760, 780, 960, 980. ITEM HAS BEEN USED BUT STILL WORKS PERFECTLY WELL, WAS PULLED FROM A WORKING SYSTEM.STILL CLEAN AND NEAT. P1 - 24-Pin Mini ATX Power. P2 - 4-Pin ATX Power. Part Number: CCCVC, RV1C4, 3WN11, J50TW, 2TXYM, 709MT, 592JG, 66VFV, 3YKG5, PH3C2. Dell Optiplex 390, 790, 990, 3010, 7010, 9010. ONLY works with the small form factor versions of the computers listed below. OUTPUT POWER 365W. If you prefer you may also feel free to recycle such materials to any local R2 or e-Stewards certified recycler. No personal check is accepted. 100% Warranty. PRICE "BUY IT NOW". CONDITION Pulled from a working computer. They are fully tested in excellent condition. Dell Vostro. Power supplies have been cleaned and fully tested, they are in excellent condition. Location: FLINT BOTTOM SHELF - G. No exceptions. We have a limited knowledge of their prior use. 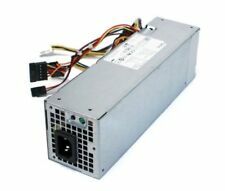 GENUINE Dell PowerEdge R320 R420 550Watt Power Supply D550E-S0 M95X4 X185V RYMG6 0RYMG6 Brand: Dell Part Number: RYMG6 MPN: 0RYMG6, CN-0RYMG6, M95X4, X185V Model: D550E-S0 Type: Power Supply INPUT & OUTPUT: Input: 100-240V Max. Output Power: 550W Compatible Product Line: PowerEdge Compatible Model: Dell PowerEdge R320 R420 Condition: New This item will be Shipped exactly as shown in the picture. Pulled from New Unused Dell T7810 servers. It was pulled from New Dell systems which we disassembled. State exactly what your item is. We will respond promptly to your inquiry. Item is used and in good working condition. Item was pulled from a working system. Loc:(B-Back). For Dell optiplex 390 790 990 3010 7010 DT desktop. Tested working. Genuine Dell product. It's important to be able to power your computer. 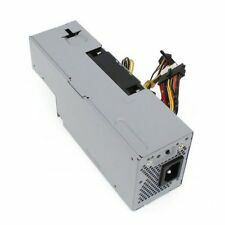 You can find a Dell computer power supply on eBay. Whether you're replacing an existing supply or building a new computer from scratch, there are a number of specifications to consider. Does the computer model matter? ATX: A configuration for desktop computers, developed by Intel. EPS: This is a derivative of the ATX configuration. MicoATX: This is a common format for gaming systems. What is the max output power? What are the connector options? A power supply may have a number of connectors. This includes looking at the number of pins that are in place as well as drives that can be connected to it. Once you have the power supply, it is then connected to the motherboard using the series of cables that are often connected. In addition to the basic connectors, you want to find out whether all of the cables are included or if you will have to purchase those separately. When you're shopping for a Dell computer power supply, Dell is the most common brand as it is the OEM (original equipment manufacturer). 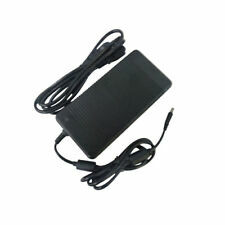 However, you can find other manufacturers that create power supplies that will fit your Dell computer. In the end, it doesn't matter what brand. If you have a preference for OEM, then Dell is the brand to look for. Otherwise, any manufacturer will work as long as it meets the specifications for your computer.